This textbook offers an effective and easy-to-follow coverage of the fundamentals of matrix analysis and numerical methods, and their applications in engineering. Each topic is presented in great detail and accompanied by a large number of thoroughly worked-out examples, as well as several related exercises. Engineering applications, ranging from mechanical and electrical to structural systems are greatly stressed and integrated throughout the book. Each numerical method is accompanied by an algorithm, which may be used for programming purposes. 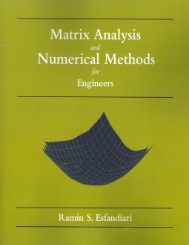 All numerical/ analytical computations in this book have been performed with the aid of MATLAB®;. 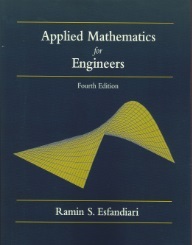 For further information and details, refer to MATLAB Manual for Advanced Engineering Mathematics by R.S. Esfandiari (ISBN: 0-9729990-5-1), Atlantis Publishing Company, 2007. A thorough presentation on linear algebra and matrix eigenvalue problem (Ch. 1-2). Complete coverage of fundamentals of numerical methods (Ch. 3). Numerical methods for ordinary differential equations (Ch. 4), partial differential equations (Ch. 5), and linear algebra (Ch. 6).